MERRY Christmas! Santa brought huge price reduction over $100k. Owner is motivated to sell! The boat has over $400,000 in recent upgrades! 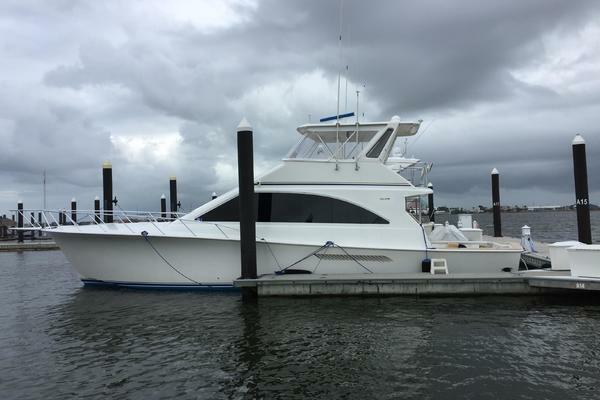 Do not miss this deal!This pristine Bertram 67 Sport Fishing Yacht has had low use and transferred from the original owner to his lifelong friend. This vessel has been lightly fished and most of the engine hours came from trans coastal trips from Florida to New York.Bronx Talehas always been Captain maintained to the highest standards with no expense spared.It has undergone many upgrades in 2016, 2017 and 2018.It has 4 staterooms with 4 heads and the stainless and aluminum hardware is in perfect condition. The flybridge has 2 custom varnished Murray Products fighting chair style helm seats with foot pedestals with a full tower both complete withall new electronics (new 2016) and cushions. The vessel has undergone an extensive renovation over the past year to include allnew cockpit teak soles and covering boards (new 2018).The interior of the yacht has the “showboat” interior by Marty Lowe. There is even a spare roll of carpet from the original run. Replacement costs 5 million plus dollars for a new “like built” and equipped boat. Bertram is back in business and once you ride this hull you will know why. Bertram has always been known as the softest ride in the biggest seas. This boat is a “must see” for any serious large sport fish buyer. Below you will read that there are way too many new upgrades in 2016, 2017 and 2018 to put into this introduction paragraph. Take a read through this listing and you will agree this is the best value on the market at this asking price. United Yacht Sales New Jersey would love to guide you through a personal showing of this 67' Bertram Convertible 2003. 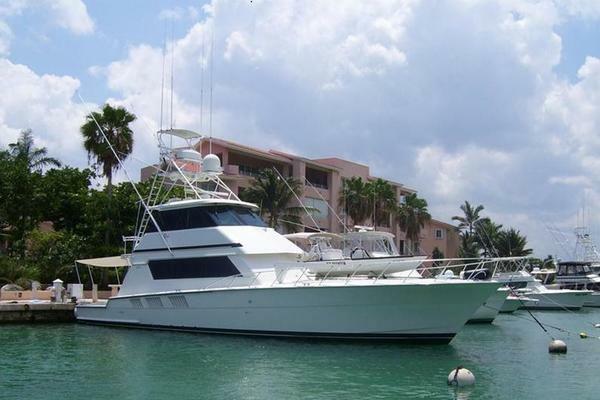 This yacht for sale is located in Palm Beach, Florida and priced at $999,000. For a showing please contact us by filling out the form on this page and we will get back to you shortly! When you first enter this extraordinary sport fish in the cockpit you notice that this boat does not move when you step on. You instantly realize you are in the “Big League” of sport boats. Then your eyes are drawn to the new teak cockpit and covering boards as well as the beautiful Murray Brothers rocket launcher fishing station. As you turn forward ship you will see the teak steps with the iconic Bertram emblem on the landing entering the salon. To your left and right you will notice the main thing every real fishing machine needs, tackled stations complete with drawers, sink on the bait station next to the engine room entry and to starboard is a very large freezer. As you scan aft you will pick up on the underside of the pit and see gaff storage, in deck fish boxes complete with Eskimo ice chipper and a great in transom fish box or it can be used as a live well for live bait fishing. You will also notice the doors on each side outboard lower sides that conceal electric retractable Glendenning cable master power cords for 2-50 amp power cords to starboard as well as salt and fresh water spigots to port.Moving forward you will notice to the port, is the way the salon sits out into the pit area with an expansive window that allows full view of the action in the pit from guests sitting inside. To starboard, you will see one of the best features which is the rod storage locker with Lexan see-thru door with a drain so you can hose your tackle while hanging in place. Behind this is the enclosed spiral staircase with teak steps for safe easy access to the bridge.As you move through the full-length glass door into the salon you will see the Marty Lowe “Show Boat” interior complete with the signature custom carpet. To starboard is the all-new AV system with a very large Samsung HD TV in a custom cabinet with the DVD and amp hidden from view. Forward of this is a cherry top bar complete with under counter bottle and glass storage. Also in the bar area is a sink prep station and Scotsman icemaker, which was completely refurbished in 2016.Across from the bar is a custom table and full sofa with storage within. That is complemented with a full seat aft separated by a built-in table facing forward for max seating and just forward of the sofa and separated with yet another built-in table (with storage below), is a very plush large seat which angles to center ship above which are classic Bertram memorabilia framed on display. The feature‘s built into Bertram’s is style and functionality. I might add the entire whisper wall headliner and all blind motors were replaced new in 2016.As you move forward again you come into the galley to port and dinette to starboard separated by a beautiful granite counter top with a recessed area aft for ease of serving food. In the galley to port, there is a full-size GE profile side-by-side refrigerator-freezer. Moving forward on the port side of this is a granite counter top with 2 Sub Zero under counter drawers, which can be refrigerators or freezers depending on your choice next to this is the dishwasher. On the counter, you will notice two stainless steel large size sinks with multi-flow faucet head on a flex removable head and in sink disposal. Under this area is more storage. On the forward bulkhead is overhead storage and to the center is a GE Profile convection microwave oven and 4 burner Kenyon sensor class cooktop. Below this is a GE trash compactor a Gaggenau oven/broiler. As you move to center ship under the counter is more storage for dishes and glassware as well as drawers for cutlery.To starboard is the custom shaped dinette with custom cherry and birds eye table top. Again in the entire galley up and dinette area, you notice the full windows for spacious feeling even in bad weather or underway you never feel enclosed. On the forward bulkhead of the dinette is more storage lockers.As you transverse to the lower decks down the angled staircase as you land you will note to the right an upper and lower full-size Miele washer and dryer units. These were installed New in 2017.Across from the landing is the head of the port stateroom which is also utilized as the day head.As you turn to your left you progress aft in the ship down two steps into the full beam master suite. You will note the island full walk around bed with bedside lights and tables storage drawers under them as well as under the bed. To the starboard outboard is cabinets below a beautiful cherry countertop. On the forward side of the stateroom is a full walk-in closet and to center next to this is a seated vanity area with mirror and lighting for the lady of the yacht. Directly beside this is locates the HD Samsung TV, New in 2016 and AV systems (VCR/DVD/VHS/CASSETTE). Below this is yet more storage drawers and compartments.To the port side of the suite is a sliding door entry to the master en-suite head and shower. This is complete with teak floors and Raritan head (New in 2017), Corian counter tops and his and her sinks with Grohe fixtures and full-width mirrors, storage behind them and under counter 110V plug-ins for shavers or hair dryers. Below this is more than ample storage as well. On the forward side of the head, the area is a full stand up glass shower with seating and storage shelves for bath items complete with teak grate floor.As you depart forward of the ship you pass the day head to the port guests/crew stateroom which has its own entrance into the day head. This head again has teak floors Raritan head (New in 2017) and fully stand up glass enclosed shower with seat and teak grate floor. The vanity has a Corian top with sink and Grohe fixtures. Above is a mirror and cabinets below and above. The adjoining door opens to upper and lower bunks with cabinets with hanging locker and its own stereo and AC control.Across the hall is the starboard guest stateroom. This suite has side by side twin bunks with its own TV/AV stereo system with 4 drawer storage below. There are reading lights and storage beside and below each bunk and located just aft and outboard is a full-size hanging locker. Moving aft again is the in-suite head with teak floors and shower. The vanity is outboard with Corian countertop and custom molded sink with Grohe fixtures. As is all of the heads the area behind the counter is a full mirror with storage behind. On the aft area is the Raritan head (New in 2017) next to this inboard side of the head area is a full stand up glass shower with seating and storage shelves for bath items complete with teak grate floor.Traveling forward up the hallway you enter the forward VIP stateroom.This suite boasts an island queen bed with reading lights and storage beside and below. Located just aft and outboard is a full-size hanging locker. Moving aft again is the in-suite head to starboard with teak floors and shower. The vanity is outboard with Corian countertop and custom molded sink with Grohe fixtures. The area behind the counter is a full mirror with storage behind. On the aft area is the Raritan head (New in 2017) next to this inboard side of the head area is a full stand up glass shower with storage shelves for bath items complete with teak grate floor.As we exit the salon to the aft to the left is the entrance to the flybridge. The easy spiral staircase makes it easy for even the senior or little children to safely transverse. As you enter the flybridge you will notice the enclosed pop up helm electronics station with storage below it and access to the upper bridge electrical station. What grabs your interest here is the all new state of the art Garmin 7215 touchscreen triple display electronics and new MTU controls (New in 2017) and the custom hardtop.For handling the beast Bertram you have two custom Murray Brothers padded luxury helm chairs with footrests. On the outboard port side, you will note the seldom seen docking station with bow thruster controls. This makes it easy for docking the boat. Above is the enclosed area for teaser reels. Forward of the helm station is the guests seating and entertaining area. This area is enclosed in an EZ2CY glass enclosure with zipping up/down access. The guest's entertaining area has wrap around seating with storage below and a cocktail in the center. On the forward side is more storage and to the port is the grill station, sink and refrigerator. All of the soft goods on the helm were redone (New in 2017).This is the perfect space for entertaining guests either underway, dockside or at anchor.To the aft port side is the entrance to the tuna tower. You climb the ladder to the ultimate birds-eye view to the tuna tower. This area is for the die-hard fisherman that want to see the fish and the baits. This area has an enclosed cage area with new bolster covers as well as new controls (New in 2017).The station has full controls and electronics to be fully functional. It also has a hard top for shelter from the elements.Entrance to the heartbeat of the Bertram Engine Room is located in the cockpit facing forward next to the stairs to the salon and the tackle station. This is a full stand up engine room with the forward bullhead encasing the fuel tank, which was an innovative design by Bertram. This not only cools the return fuel from the engines but sound dampening the engine noise from the boat and does not change the static line of the vessel underway as fuel is burned off. It also allows a fuel sight gauge for accurate fuel management. The biggest asset is the MTU-2000 massive engines on the port and starboard sides. But as big as they are there is enough room to easily get around them for maintenance. To the port, outboard is located the battery banks which house 8 AGM batteries (New in 2016) as well as new 2- master-volt chargers (New in 2016). Also, all MTU controls and computers were replaced as was all 5 of the bilge pumps and switches, air conditioning pumps (New in 2016). Freshwater, and salt water pumps (New in 2018).The outboard of the starboard side of the engines houses the fire extinguishing systems. One both sides are engine air vests with Delta T air systems.Aft of the engine room is the generator and pump room. This houses the two Kohler 23 KW generators in their sound shields. This area is also home to the salt water supply pump, AC raw water pump and slat water chipper units. The beauty of this area is that the deck above is removable in the event you must remove a gen set as is the top of the entire engine room for major engine work.As you read the equipment list you will see many items have been updated. This truly is the best value on the market at this time. Plotter -Garmin 7215 (New 2016) THERE ARE 3 SCREENS!!!!! GPS-Garmin 7215 (New 2016) THERE ARE 3 SCREENS!!!!! Radar-Garmin 7215 72 mile touchscreen (New 2016) THERE ARE 3 SCREENS!!!! !